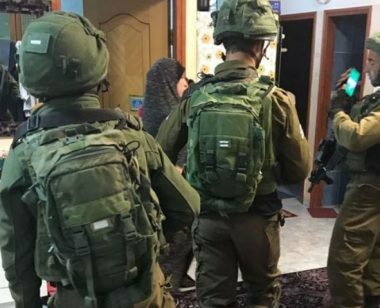 Israeli soldiers abducted, Wednesday, two young Palestinian men, including a former political prisoner, from their homes in Tulkarem and Nablus, in northern West Bank, after invading their homes and searching them. Media sources said the soldiers abducted Tha’er Rafe’ Ekbariya, from his home in Shweika area, north of Tulkarem. The soldiers also invaded Salem village, east of Nablus, searched many homes and abducted a former political prisoner, identified as Mohammad Nasouh Eshteyya, 28. The soldiers also injured ten Palestinians, including a journalist, in Nablus. In Bethlehem, the soldiers invaded Doha town, southwest of the West Bank city of Bethlehem, and abducted two young Palestinian men. The soldiers also fired gas bombs and concussion grenades at local protesters, causing fire in one car. 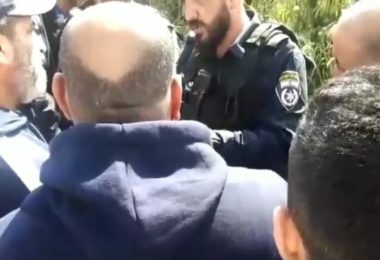 Furthermore, dozens of Israeli soldiers invaded the southern West Bank city of Hebron, al-‘Arroub refugee camp and the nearby Halhoul and Beit Ummar towns, before storming and searching many homes, and abducted eight Palestinians, including a child, in addition to summoning two others for interrogation.